The components are also available as separate items, listed below the packages. You will find links to instruction manuals for components in the karaoke packages. A quick to setup (in its simplest configuration) and easy to use package that offers all the sophistication you can wish for but which can be learnt by users almost instantly. This is an ideal system that can be left and run by the singers themselves without the need for a karaoke jock or host, making it ideal for use in pubs or at corporate karaoke nights. It can also be dressed up giving it a slick appearance. The system is based around a 24” touch screen on which you select your songs, enter your name and add yourself to the queue. The system then connects to a base system in which a simple to use mixer, dedicated to karaoke is located, along with a receiver for wireless microphones (of which two are supplied as standard but which can be upgraded to 4 microphones) or alternatively swapped for wired microphones if preferred. On to this you can connect a wide variety of speakers to suit all environments, from a simple pair of 8” speakers for intimate parties all the way up to a pair of high powered 15” speakers and subwoofers for events in a very large venue. We can also supply the system without speakers if you already have these. Additional monitors up to 40” in size can be added to the system for guests or audience to watch the lyrics as they appear. 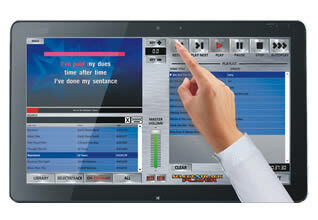 The system contains over 10,000 karaoke songs in a huge range of styles to meet almost any situation. There are particularly good selections of both Country (modern and classic) and Rock music along with current chart music and all the karaoke favourites. The system is updated regularly to keep current. Printed songbooks are supplied from which to make your selection, and is also available to download from our website below onto a suitable smartphone or tablet. 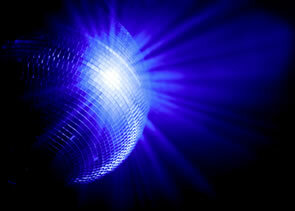 We can also supply a range of lighting and starlight back drops to make the experience even more special. Overall you will not find a better, more flexible nor more accomplished karaoke system to hire, whatever type event you are planning. Requires minimum of 2 x 13 amp sockets. Starcloth backdrop for really special evenings when you have superstars performing! If you have a specific requirement not covered above then please contact us. 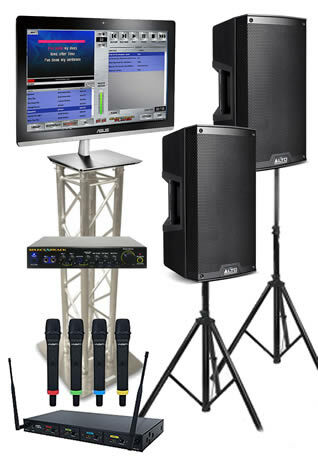 We can add staging, larger PA systems, delivery and installation if required. This package supplies everything needed to run a great evening of Karaoke for friends and family in a large house or small hall for an audience up to 80 people. 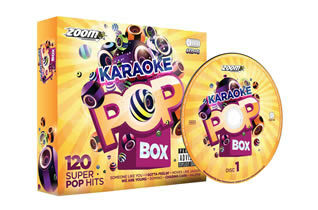 It includes a collection of over 2,000 of the most popular Karaoke songs across a wide range of styles, so there should be something to keep everybody happy! It also allows you to run a CD based disco. Requires 1 x 13 amp socket. This package is ideal for a small house party or a girls karaoke evening and simply plugs in to your TV set, using its monitor to display the lyrics. However, as sound from TVs is commonly poor and won’t go to a sufficiently loud volume for karaoke, we don’t recommend relying on the set’s inbuilt speakers. It is more desirable to output the sound via a Sound bar, surround sound system or connected hi-fi.if possible. If you do not have one of the above then we can supply easily connectable powered PA speakers which will do a much better job (see options for details). The system is supplied with two wired microphones, an SD card with approximately 650 songs ranging from classic karaoke favourites to current hits and a song list. A compact dual player and mixer which plays normal CDs along with CD+G karaoke discs. It is combined with a full function mixer with three mic inputs, two with echo and delay effects. It also features a key change control to accommodate the vocal range of any karaoke performer. 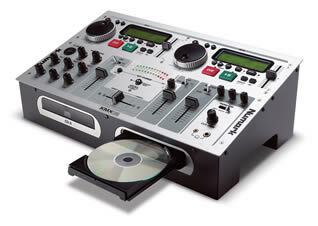 It is also a capable CD based disco CD player and mixer. A convenient CD+G/MP3+G/DVD player that will play all major formats for karaoke, as well as CDs, mp3, mp4 CDs and DVDs and off SD cards. 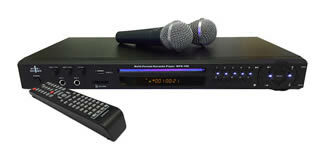 It also has a pair of mixable microphone channels with echo making it an ideal unit for playout through a television for simple home karaoke or as an add-on to a disco with its separate audio out via RCA. 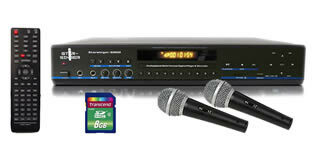 It can also record your karaoke performance onto an on-board SD card. Supplied with two wired microphones, a remote control and all necessary cables. 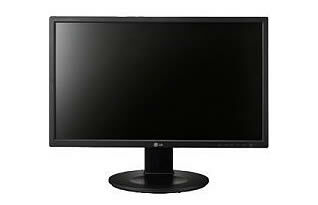 Monitor suitable for running a Karaoke evening or showing a slide show from a laptop. Supplied with mounting bracket, stand and 5m VGA cable. A small collection of approximately 400 well known songs from the 60s to the present date. Ideal to get your karaoke party guests up to the microphones. Suitable for all players capable of decoding the CD+G format. 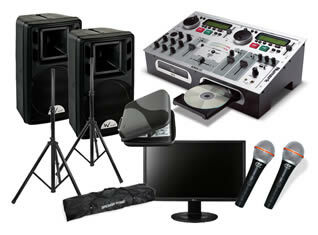 See the Microphones, Live Sound Mixers & Processors page for a range of styles and qualities, both corded and wireless.